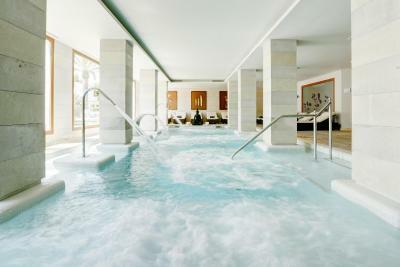 Lock in a great price for Grupotel Los Principes & Spa – rated 8.6 by recent guests! I’m struggling to find something positive to say, except it was right on the beach. Location was excellent, right next to the beach. Food was very good, with different cuisines and varieties every day. Room was clean. Staff is very kind and helpful. I have to single out Joan and Nina who went extra mile to make our stay enjoyable. Hotel has many activities for kids, including two small pools that the little ones love. This was our second time staying in this hotel, so I highly recommend it. And many guests there were coming multiple times to the hotel which is a sign that speaks for itself. We will be back again for sure. Location was perfect - best slice of beachfront in Playa de Muro. 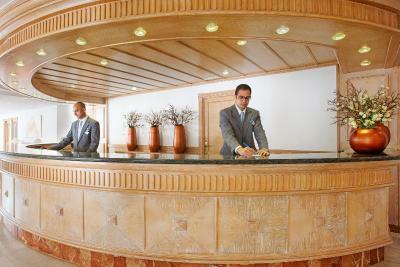 The staff were also very friendly and accommodating. The activities for children also worked really well with our 5 year old. She enjoyed the kids club, especially the mini-disco every night after dinner. Helpful and very polite staff, excellent food and wonderful location. very, very good personnel and great location to relax. food was surprisingly very good, much better than many 4 stars hotels i have visited around. also great spa and massage. Stay itself was really amazing. Hotel is nice, close to beach and also rooms big enough for stay. Service was great and breakfast and dinners unbelievable, really great organized and the meal, perfect :). Thank you and I look forward to staying at this hotel in future again :). Great location right at the beach, plenty of sun loungers on the territory so there’s no need to rent them at the public beach. Excellent food - I would highly recommend taking half-board. Location is excellent, staff is polite and helpful, food (especially dinners) is delicious and varied. 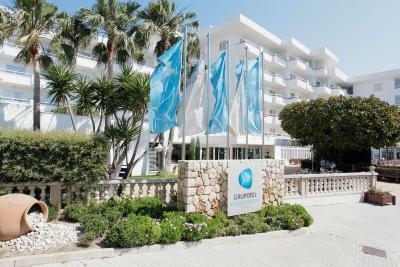 The first half of our holiday we spent at Meliá Calviá Beach in the western part of Mallorca for comparable price and we can compare the places, hotels and services. The beach and the atmosphere in Calo Muro is much like holiday town. 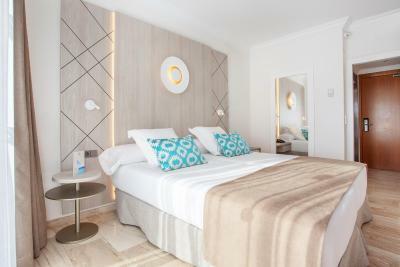 But some thinks like free deposit box, free fresh towels on the sunbeds area, room cleaning twice a day, better breakfasts and free drinks at 5 pm we liked more in Calviá Beach. Beach next to hotel is fantastic , location is great with only 10 min drive to old town , good choice of food in the restaurant , hotel is very clean and most of the staff pleasant and polite . Location is great.The hotel is near the beautiful beach and sea. 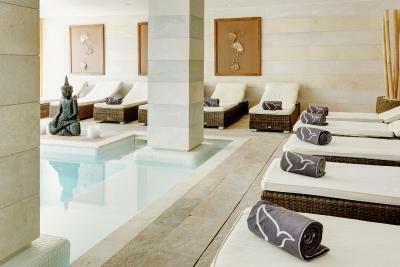 Grupotel Los Principes & Spa This rating is a reflection of how the property compares to the industry standard when it comes to price, facilities and services available. It's based on a self-evaluation by the property. Use this rating to help choose your stay! One of our top picks in Playa de Muro.Los Principes & Spa has an ideal setting overlooking Playa de Muro Beach and Alcúdia Bay. 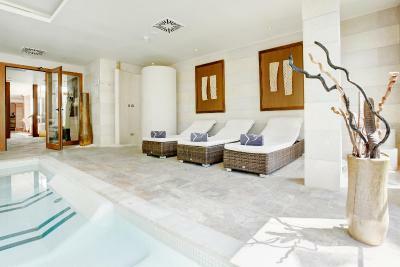 Set in attractive gardens, it features an outdoor pool, spa and rooms with balconies. 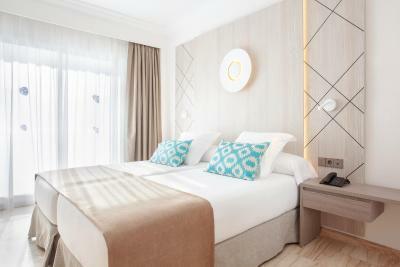 This Grupotel offers bright, air-conditioned rooms with satellite TV. 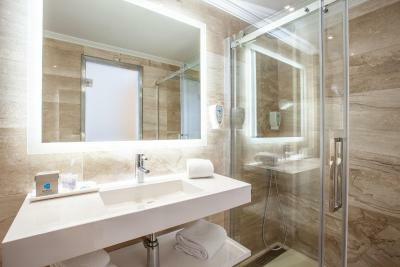 Each room has a fully equipped bathroom. 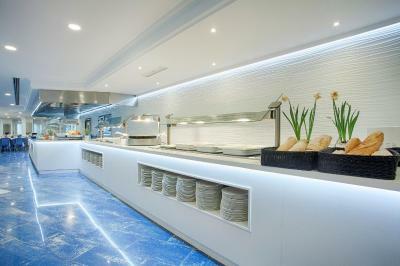 The buffet restaurant serves a range of Mediterranean cuisine and features show cooking. 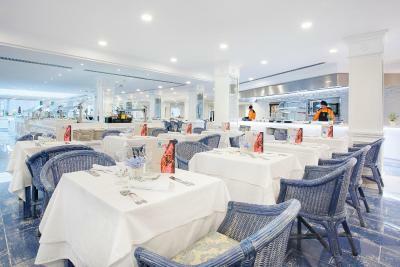 There is also a small bistro, which offers sea views. 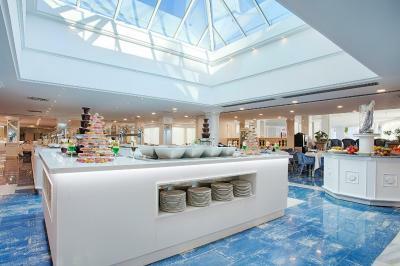 Guests can relax in the lounge bar or on the terrace. 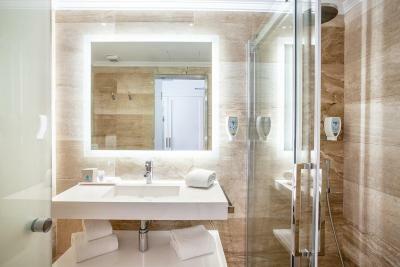 The on-site spa features an indoor pool, hot tubs and sensation showers. 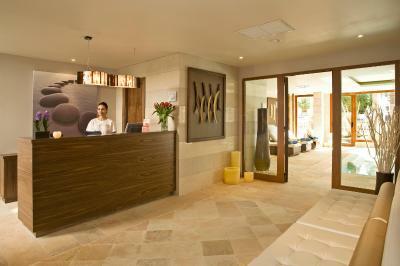 Treatments include massage, hydrotherapy and aromatherapy. There is also a gym and bicycle rental within the property. The hotel is 1.2 mi from S’Albufera Park and the nearby lake. 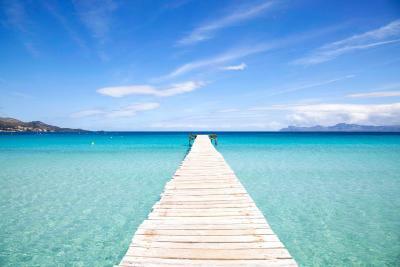 The resorts of Ca’an Picafort and Alcúdia can be reached in 10 minutes, by car. Seasonal hotel open from March to November. 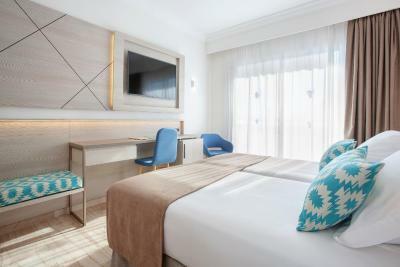 When would you like to stay at Grupotel Los Principes & Spa? 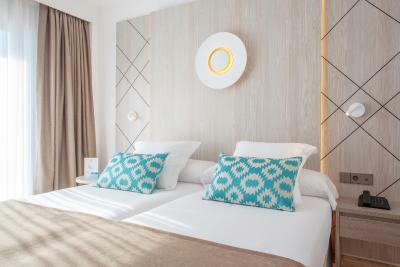 This air-conditioned room features satellite TV, a mini-bar and a private balcony with partial views of Muro Beach. The bathroom includes a hairdryer. This room features 2 single beds that can be pushed together. This air-conditioned room features satellite TV, a mini-bar and a private balcony. The bathroom includes a hairdryer. 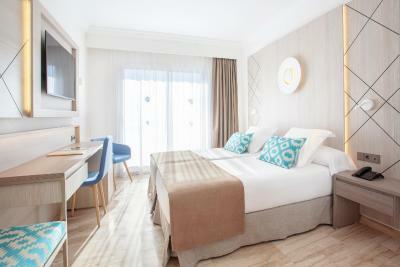 This air-conditioned twin/double room features a balcony, satellite TV mini-bar and private bathroom with hairdryer. 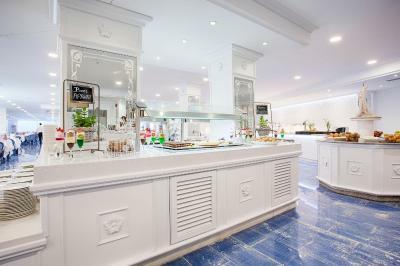 House Rules Grupotel Los Principes & Spa takes special requests – add in the next step! Grupotel Los Principes &amp; Spa accepts these cards and reserves the right to temporarily hold an amount prior to arrival. Grupotel Los Principes & Spa accepts these cards and reserves the right to temporarily hold an amount prior to arrival. Please note that for dinner, formal attire is required. 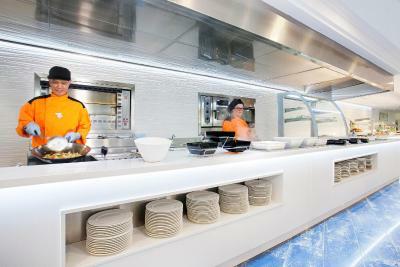 Male guests are required to wear a long-sleeved shirt and long trousers in the restaurant. Air conditioning was not the best, at least in my room. The need to pay for the safe. Our room was dark and smelly, balcony is overlooked, room (121) is not private. Paid safe box in the room. Beds not comfortable-pillows and mattress too hard. Have to pay for sun beds on the beach , not part of hotel facilities . Hotel beach towels can not be changed everyday . Does not have enough irons , bring your own . Dress code in restaurant for dinner is old fashioned - long trousers for gents ? Does not make sense in such a hot climate . Except air, everything was extra. You should pay for everything you may need. If you ask me, Since all beaches are perfect, you do not need to pay so much money to hotels near the beach. I do not think we got more than we paid.It is very expensive in terms of service quality and facility specifications.And I have to mentione about weak animation as well. The whole hotel badly needs a complete refurb. Its more like a 2* than a 4. We travel alot and it is the worst place we have stayed in years. I’m at a loss as to how anyone can call it 4 star. The beds are so hard, there are no doubles only singles pushed together, thin lumpy pillows, frayed grey bath towels, dusty rooms, toilet running, light broken, beach towels changed every couple of days - only at certain times. I can’t count the number of times the waiting staff dropped plates or glasses, it was almost comical. You have to sit at the same table every day. The food was ok but I just couldn’t get past everything else. We had issues at check in with our room and after much discussion with the staff and the meeting with the Director, they changed our room and gave us some compensation but it was a small improvement. We feel let down by other reviewers prior to booking and in hindsight I should have rechecked the latest reviews just before we checked in. If we could have found another hotel nearby to fit our family of 5, we would have but it was peak season. There is extremely limited parking if you come with a rental car. You sort out your own luggage on a trolley if you can find one. A sad end to our holiday. If I have to single out anything, it is that guests have to pay for sun-beds on the beach, but I guess this has nothing to do with the hotel, since the beaches are for everyone to use, not just hotel guests. Everything was really great. We just thought that dinner could be extended until 10 PM as, the fact that it only opens until 9 PM, limits the afternoon a little bit. The hotel really exceeded our expectations when it comes to its quality and price. The location is great as the hotel is really in front of the beach. The staff is really nice and helpful, always ready to help. Breakfast is very nice, with a big variety of options that slightly changed on a daily basis. Dinner is delicious and tasty always with many options that will for sure please everyone. 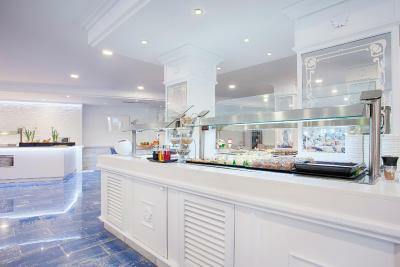 We found the buffet super nice and interesting as it changed everyday. Although drinks are not included, prices are very reasonable! In our case the room was very comfortable and nice (at first we were in a quite noisy one at the back, but when we "complained" about that, they changed the room ASAP)! The shows every evening are enjoyable and a good end of day. Its very clean. Good location, beach and shoreline. Food is very good aswell. Ana and the front desk team were exceptionally helpful and all the servers and kids club people were really friendly. The food was excellent. Ideal for a calm kids friendly holiday. Fun pool and lovely beach. The hotel needs a massive renovation. It’s outdated and in need of some major fixes. We asked to be moved our first evening because we found the air conditioning too hot. They were able to transfer us to a cooler room, but still not cold enough to fight the Mallorca heat. This property has so much potential. It just needs some updating. Tired hotel in over-developed-touristy area in Muro and Mallorca. I would not stay here again and in any other place around. Not for me. Poor air conditioning in the room and very small bedroom / bed. Photos look much better than reality. This is a hotel for mass tourism and hungry families. Need to wear trousers to go for dinner - ridiculous and pretentious. Good breakfast and dinner. Polite staff.